Great concept, terrible execution, it really is as simple as that. It’s a real shame that this movie isn’t better than it actually is, or seems like it should be. There’s the stellar cast, the great director, (Alexander Payne, who made Election, Sideways, and The Descendants,) and a story that looks incredibly creative. The concept is more certainly unique and interesting. It’s Honey I Shrunk The Kids for the middle-aged adults. Only instead of containing the story and being about the handful of characters that were established in the first half of the film, (and the relationships that were established,) this movie throws everything from the first half out the window, and goes in some radically ridiculous directions. If the first half is about the relationship between a husband and wife who decide to shrink themselves, and one of them decides to go through with it while the other doesn’t, you would think the second half would pursue the ramifications of this. It doesn’t. Instead, it keeps pushing more and more scene fiction concepts on us, trying to bite off way more than it can chew, and leaving the human drama elements that make most of Payne’s films so good, way behind. The movie should have kept up the Paul and Audrey storyline, whether they got back together or not. Instead, Audrey drops out of the story, and Paul pursues ideas and scientists that deal with notions of the end of the world. It becomes a mess. 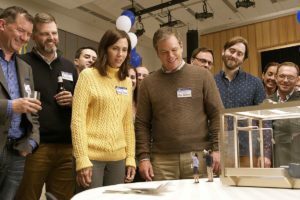 Downsizing is the latest movie from Alexander Payne, the filmmaker behind some terrific movies, such as Election and Sideways. Unfortunately, this one doesn’t quite measure up. And that’s pretty surprising when you consider Payne’s track record. Not only is he a great filmmaker who as a keen sense of how to make a black comedy, but compound that with the fact that the concepts and storyline to this movie both look great. And yet somehow, what starts off as incredibly creative goes downhill very quickly. By the time we reach the second half of the film the movie has gone in all sorts of weird directions that don’t even relate to anything from the first half. It’s as if the laws of filmmaking and storytelling went out the window with this one, and the more the movie went on, the more the events on screen fell further off the rails. It’s a real shame considering how much this movie appeared to have going for it. The cast alone, is a no brainer, with Matt Damon at the helm. Here’s an actor who is so smart and talented that he carried the Martian on his shoulders as what was, for large portions of the film, a one man show. Damon rocked the Jason Bourne series so hard that it led to us getting a grittier Batman than we ever had before (with Christopher Nolan’s Dark Knight series,) and a darker, grittier Bond (with the Daniel Craig movies.) Now, attributing all of that to the Bourne movies is dishing out a lot of credit, but you have to understand what Bond and Batman were like before Bourne came along. We’re talking about the Pierce Brosnan Bond movies and the Val Kilmer – George Clooney Batman films. And after the Bourne movies, all of that changed. But the Damon of now, is not the Damon of then. He’s not the Damon of the first three Bourne movies. Not anymore, While ten years ago, Damon was riding a great wave of success, (and twenty years ago he had his breakout with Good Will Hunting,) these days Matt Damon just isn’t what he used to be. Just try and compare the first three Bourne’s to the latest one, called Jason Bourne, which was an absolute stinker. Look at the movie Damon made with Zhang Yimou, the Great Wall, and what a mess it was.So clearly this actor isn’t what he used to be. He’s still good, but not everything he touches turns to gold, the way it once did. Luckily he’s surrounded by some other talented stars, in the form of SNL vets Kristin Wiig and Jason Sudeikis. Only there’s a problem. They aren’t in this movie nearly enough. In the second half of the movie, these two are more or less replied by Christop Waltz. It’s not a fair tradeoff. Waltz might be great in Tarantino films, but he’s not exactly good in anything else. Tarantino introduced the actor to the world with Inglorious Basterds, which means he got in on the Waltz game before people really knew this actor. And let’s be hones, Waltz has been great in those Tarantino movies, (and has won two oscars, one for each of those films.) But that is most definitely as much about Tarantino and the writing as it is about the actor. And here, in Downsizing, Waltz isn’t exactly bad, but he doesn’t really bring anything to the table either. By the time he appears, the movie is already on it’s decline and doesn’t exactly recover after that. So now let’s talk about Payne. Yes, he’s made some great movies. So why and how does he go so wrong with this one? The answer to those questions are actually very simple. Alexander Payne is a master of real human drama and black comedy. What he’s not a master of is science-fiction. And that’s what this movie is. The movie is a mess and clearly proves that Payne should stay in his comfort zone. Let’s put it this way, Payne gets a taste of sci fi in the first half and just keeps going and going with it, leaving the human drama behind and giving us more and more sci fi ideas, until we just don’t care anymore. Another filmmaker (a sci fi filmmaker,) would have known when it was time to reign things back in. But not this guy. Aside from those other movies that Payne directed, he also made the George Clooney movie, The Descendents. Now think about that movie for a moment. It was (spoilers,) all about a man finding out his dead wife was having an affair and then going to pursue the guy she was cheating on him with. 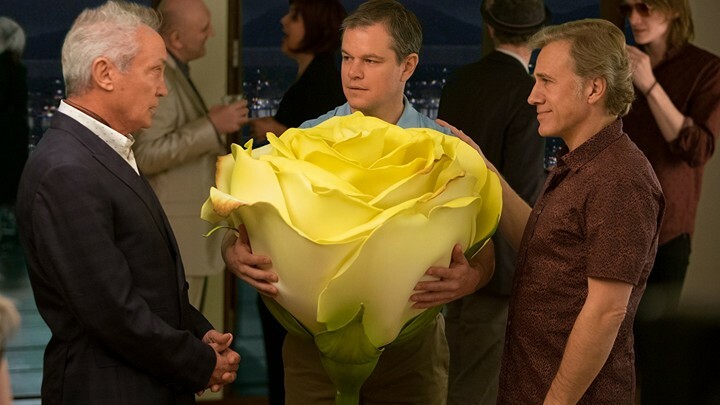 Well, Downsizing’s version of that would have been that he found out about the affair in the first half, and then left and met someone else in the second half and never looked back. It would mean the affair storyline never came back again. And that’s the problem with this movie. The Kristin Wiig character never comes back and her entire storyline is more or less forgotten. In Downsizing, we meet Paul and Audrey Safranek, (Damon and Wiig,) a couple with high hopes and some financial woes. They buy a nice big house together, but then the bills start piling up. And soon they’re considering other options. That’s when an old friends shows up (Jason Sudeikis,) who has downsized or shrunk himself. Soon Paul and Aubrey are doing the same thing, realizing the cost benefits. The Downsizing process itself is pretty neat, and shown to us in great detail. This is the kind of sci-fi material that actually works. Defining the process. And it should end there. If that was it for the sci–fi elements, than it would have been more than enough. But instead this movie just keeps going with them, talking about the end of the world and of human kind, and having our characters travel to Norway to find scientists and bunkers. There was no reason to go this far with the story. And what is lost, by doing that, is the human story about people and relationships. Basically, the storyline about the relationship between Paul and Audrey is just thrown out the window, in order to have Paul go see the world and search for scientists. This is especially disheartening because the Paul and Audrey storyline had a lot of potential. After going through the process and shrinking himself, Paul wakes up to find that Audrey hasn’t gone through with it herself, and that she is breaking up with him. This is both funny (in the black comedy kind of way that Payne is so good at,) and incredibly interesting. We want to know more. We want to at least see Audrey again. And even if Paul doesn’t end up with her by the end, and does meet someone else, at least we would know what happened to Audrey and what she was up to. Think of Forgetting Sarah Marshall. At the start of the movie, Sarah breaks up with Peter. Now what if Sarah disappeared from the story after that? It would have been a very different film and not for the better. Downsizing has a great concept, but sure does manage to screw it up. The idea of shrinking oneself is great. The details that go along with this, including the process of how it all works, is also great. And so is the fact that one of the partners decides not to go through it, and doesn’t tell her spouse until it’s too late. All pretty good stuff. Now, that’s not to say that the movie is flawless until this point, it takes way too long to get going, showing us every little detail about how the idea of downsizing came about. But from the moment we see Paul and Audrey together (probably about ten minutes into the movie,) all the way through when they separate, we’ve got a pretty good movie. And then Audrey disappears, Paul pursues a relationship with a one-legged Vietnamese woman, and goes to Norway to search for scientists. And all of this shows how badly the movie went off course. It would have been a whole lot more funny and more interesting to see Paul and Audrey trying to work passed their problems, with him being small (and trying to convince her to shrink,) and her being big. But that would have been a different, and much better movie.